From homosexual law reform to drag kings; from HIV/AIDS to lesbian artists; from old age to movie-going — gay and lesbian life in Australia has always been a vibrant canvas. 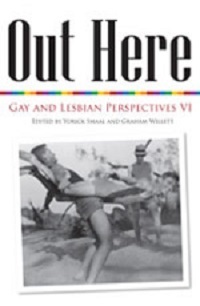 In Out Here (Monash University Press), the sixth in the Gay and Lesbian Perspectives series, established and newly emerging Australian historians cast an eye over the past hundred years or so. Edited by Yorick Smaal and Graham Willett.